Every day many people come to this district. 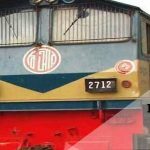 To make your journey enjoyable here we give you the perfect information about Dhaka to Mymensingh train schedule, all train lists from Dhaka to Mymensingh and all class train Bangladesh Railway ticket fare. Mymensingh is one of the administrative districts of Bangladesh. It is a part of the Dhaka division. Though it is one of the educational districts of Bangladesh, every day many people come in this district from Dhaka and other parts of the country. Many educational institutions such as Mymensingh Medical College, Mymensingh Girl’s Cadet School And College, Mymensingh Agricultural University, Mymensingh Polytechnique Institution etc are situated here. 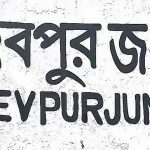 Besides this there also have some tourists place like Zainul Abedin museum, the bank of the Brahmaputra river, Garo Pahar in Sherpur which is the part of Mymensingh district, National Heritage Museum etc. So at least for once, you should come here only to pay a visit. There are so many intercity trains which take travel on Dhaka to Mymensingh. Respectively, there have 6 intercity trains which travel from Dhaka to Mymensingh. There is no selective intercity train which only travels for Mymensingh but there have many intercity trains which cross over Mymensingh district and take the break. So, one can easily make a journey by this trains. Apart From these trains, there have many mail trains also which run between Dhaka to Mymensingh and Mymensingh to Dhaka. Now we are giving the train schedules of these trains with their ticket price. Here I have enlisted the schedule of Dhaka to Mymensingh and as well as Mymensingh to Dhaka. Here is all intercity train schedule of Dhaka to Mymensingh trains. These trains make the journey from Kamalapur Station of Dhaka city. After thirty to forty minutes these trains come to Dhaka Biman Bandar Station. So the passengers can board from these stations with their preference. Some of these trains take an off day on every week. So make sure that which are available and not available on your preferable date. Here I am mentioned about all this data. Stay with us to make your journey safe and sound. TISTA EXPRESS: At first I want to say this train is not available on Monday. So if you want to journey on Monday then you should not board on this train. This train makes the journey at 7.20 AM from Dhaka Kamalapur Station after 30/40 minutes it will come to Dhaka Biman Bandar station. So you can board on this train from any of this station. This train arrives at Dewanganj Bazar in Mymensingh at 10.35 AM. The serial number of this train is 707. BRAHMAPUTRA EXPRESS: Firstly you will be happy to know that this train is available at all day of a week. This train also makes his destination for Dewanganj Bazar in Mymensingh. It stars his journey from Dhaka Kamalapur railway station at 6.00 pm. So if you want to go in the evening then this is a perfect choice. It arrives at 9.30 PM to his destination. The serial number of this train is 743. 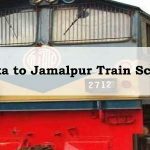 JAMUNA EXPRESS: This train is also available at all day of the week. So you can plan your journey for any day. At 4.40 PM it starts his journey from Dhaka Kamalapur station. After 30/40 minutes it takes a break in Biman Bandar station. So you can board from any station between this two. It arrives at 8.00 PM on BB Setu East of Mymensingh. 745 is the serial number of this train. HAWR EXPRESS: Don’t worry, as the word is Hawr but it is an intercity train which makes you travel from Dhaka to Mymensingh. This train is available in all days of a week except for Wednesday. So, avoid it on Wednesday. It leaves from Dhaka kamalapur station at 11.50 PM. Arrives at Mohongonj in Mymensingh at 3.50 AM. Here you should think about if you want to travel at the late night then it is the best option for you. The serial number is 777. AGHNIBINA EXPRESS: The last destination of this train is Tarakandi of Mymensingh district. If this is also your destination then you can board on this train without any pressure. It starts at 9.40 AM from Kamalapur station of Dhaka. This train arrives at 12.37 PM at his destination. You should be glad to know that this train is available at all day on a week. The serial number is 735. 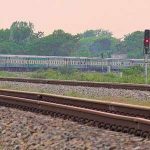 MOHONGONJ EXPRESS: This is the last intercity train which travels from Dhaka to Mymensingh. It starts at 4.20 PM from Dhaka Kamalapur station. At 5.20 PM it arrives at its destination Mohongonj of Mymensingh. 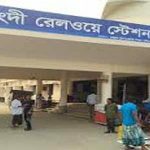 It must say that it is one of the fast train services among all the intercity train which travel on Dhaka to Mymensingh. The serial number of this train is 789. You can make a plan to take a trip by this train at any day except Monday of the week. On Monday this train is not available at all. So this is the all about the intercity train schedule of Dhaka to Mymensingh train schedule. Now we will give you information about the mail trains which travel from Dhaka to Mymensingh. DEWANGONJ COMMUTER: This train’s make his journey from Dhaka to Dewanganj Bazar of Mymensingh. It starts its journey at 5.40 AM very early in the morning from Dhaka. You can board in this train from Kamalapur railway station or from Biman Bandar railway station. As it is a commuter train, it will take a long time to end his journey. At 11.45 AM it arrives at his destination. This train is available on all day of a week. JAMALPUR COMMUTER: Dewangonj is also the last destination of this train. As a commuter train, it also takes time to reach on his destination. At 3.40 PM it starts his journey towards the destination from Dhaka. At 6.15 PM it arrives at his destination. You can board on this train at any day you want as it has no off day. BOLAKA COMMUTER: It makes journey for Mymensingh town. So if Mymensingh is your destination then you can travel on this train. But make sure that you have enough time to make a journey. It starts towards to Dhaka at 10.30 AM. At 2.10PM it arrives at his destination which is Mymensingh. It is available on all day. 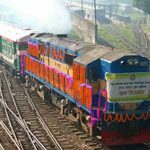 ISHKHAN EXPRESS: It is another mail train which travels from Dhaka to Mymensingh. It boards from Dhaka at 11.30 AM in the morning. It arrives at 9.45 PM in the night to Mymensingh. It is a super slow train service. So it is your choice if you want to travel on this. MOHUA EXPRESS: The name is very beautiful of this train. It starts the journey at 8.10 AM and arrives at 2.50 PM on his destination. It leaves from Dhaka Kamalapur Railway station and arrives on Mohongonj of Mymensingh. VAWAL EXPRESS: The last mail train is Vawal express. As its name is Vawal but its destination is Dewangonj Bazaar of Mymensingh. It starts at 9.00 PM from Kamalapur Railway station in Dhaka. At 5.40 AM it arrives at Dewangonj Bazaar. In the upper part, I have already mentioned about the Dhaka to Mymensingh train schedule. Now I’m going to tell about the Mymensingh to Dhaka train schedule. As I have already given you a keen information about the train service as to how much they take time to reach, how much it will be pleasant if you choose any of from those. 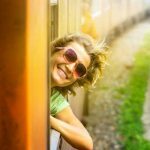 So in this part, I just tell you about the time duration to reach on the destination, and also about the departure and arrival times of these trains. As you already know about which train travel on this route, so I want to inform you that there is no new train service. The same intercity trains also make a trip for Mymensingh to Dhaka. So let’s know about them. TISTA EXPRESS: After reach at Dewangonj Bazar in Mymensingh, it again makes its journey for Dhaka. It leaves from at Dewangonj Bazar at 5.10 PM and reaches at Dhaka kamalapur railway station at 8.20 PM. Before arrives at Dhaka kamalapur railway station it takes a break at Biman Bandar railway station. So if you want you can get off on this station too. On Monday this train is not available for Mymensingh to Dhaka. 708 is the serial number of this train. BRAHMAPUTRA EXPRESS: As we know it also stops at Dewangonj Bazar in Mymensingh, it back from this station too. It leaves the station at 9.10 AM and at 12.30 PM in Dhaka kamalapur railway station. Before reach on this station, it also takes breaks on Biman Bandar railway station. So it’s your choice in which station you want to get off. This train is available all day of a week. The serial number is 744. 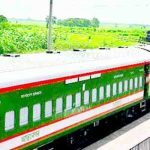 JAMUNA EXPRESS: It makes the journey from BB Setu East of Mymensingh. At 4.35 AM it makes his journey towards Dhaka. At 7.40 PM it arrives at Dhaka kamalapur railway station. Probably it also takes the break at Biman Bandar Railway Station so you can get off on this station too. This train is also available on all day. 746 is the serial number of this. HAWR EXPRESS: This train departure from Mohongonj in Mymensingh at 11.00 AM. It reaches at 2.15 PM at Dhaka Kamalapur Railway Station. Except for Thursday, it is available on all day. 778 is the serial number. You can also get off at Biman Bandar Railway Station if you want. AGHNIBINA EXPRESS: At 7.15 PM it leaves from Tarakandi of Mymensingh. At 10.35 pm it reaches Dhaka Kamalapur Railway Station. It is a journey of almost three and a half hours. This train is also available on all of the days. The serial number is 736. MOHONGONJ EXPRESS: at first I want to inform that this train is not available on Monday. It departs from Mohangonj at 3.02 PM and arrives at Dhaka Kamalapur Railway Station at 6.20 PM. 790 is the serial number. Now let’s get to know about Mymensingh to Dhaka mail train schedule. DEWANGONJ COMMUTER: It leaves the Dewangonj Bazaar station at 3.33 PM. At 7.15 PM it arrives at Dhaka Kamalapur Railway Station. This train has no off day. 48 is the serial number of this. JAMALPUR COMMUTER: It leaves at 7.33 AM from Dewangonj Bazaar station of Mymensingh district. At 11.15 AM arrives at Dhaka Kamalapur Railway Station. It is also available on all day. The serial number is 52. BOLAKA COMMUTER: This train departs from Mymensingh station at 1.45 PM. Arrives at 5.25 PM at Dhaka Kamalapur Railway Station. Before reach on this station, it also takes a break at Biman Bandar Railway Station. It is available for any day. 50 is the serial number. ISHKHAN EXPRESS: This train departs from Mymensingh station at sharp 12.00 PM. It also reaches at Dhaka Kamalapur Railway Station at sharp 11.00 PM. It’s too long journey for anyone. So make sure about the fact. 40 is the serial number and it has no off day. 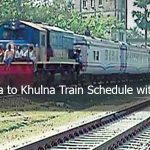 MOHUA EXPRESS: It starts from Mohongonj station of Mymensingh. At 5.22 PM it starts the journey. And at 9.25 PM it arrives at Dhaka Kamalapur Railway Station. There is no off day for this train. 44 is this train’s serial number. 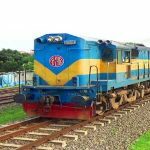 VAWAL EXPRESS: It starts its journey from Dewangonj Bazaar of Mymensingh. The last destination is Dhaka Kamalapur Railway Station. To reach on his destination it leaves at 5.30 AM and arrives at 11.45 AM. The serial number is 56. It is also available for all day of a week. 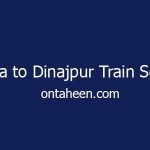 Here is the all about of Dhaka to Mymensingh train schedule and Mymensingh to Dhaka train schedule. 2nd Class General -35 BDT. First Class Chair -175 BDT. So this is the all about Dhaka to Mymensingh train schedule with all train list and the train ticket price. Now make the best journey and enjoy it. Thanks to visiting our site.